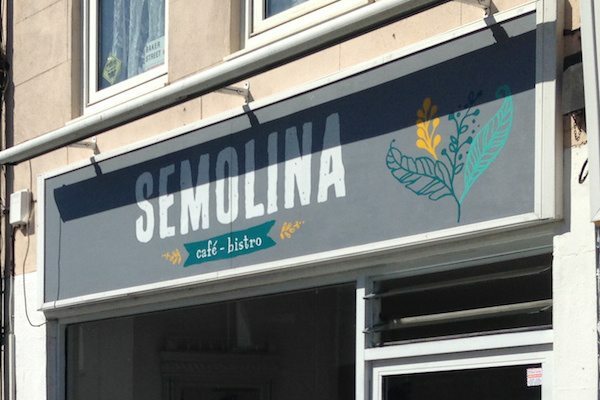 I first heard about Semolina a couple of years back, when I noticed it topping the charts as one of Brighton’s best restaurants. Yet, somehow, almost two years passed and I still hadn’t been. Last Thursday, I finally made it. Located just off London Road, Semolina has been making waves since it opened in 2014. Run by husband and wife, Linda and Orson, this café/bistro prioritises seasonal ingredients from Sussex producers. When my friend Margeaux and I stepped inside, we felt like we’d been welcomed into Linda and Orson’s home. Mirrors and pictures decorate the walls, and there are just 10 tables, giving a relaxed, intimate feel. 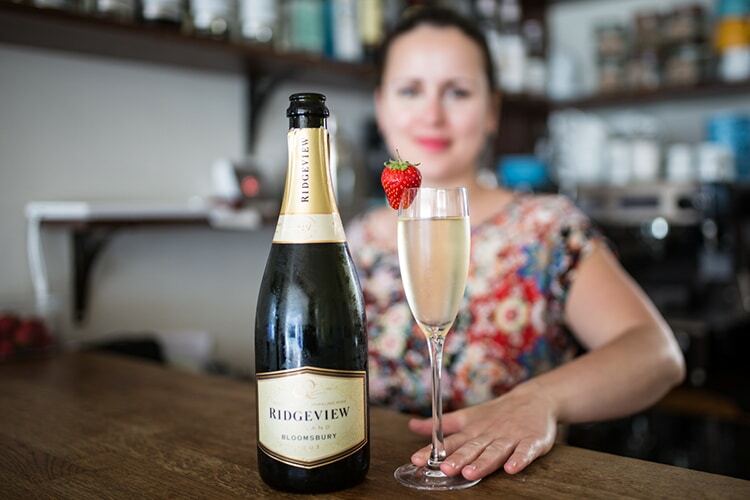 There’s an extensive drinks list which, again, features local produce like Ridgeview wine and Sussex IPAs. Cocktails are a standout feature, with in-house creations that include six espresso martinis. 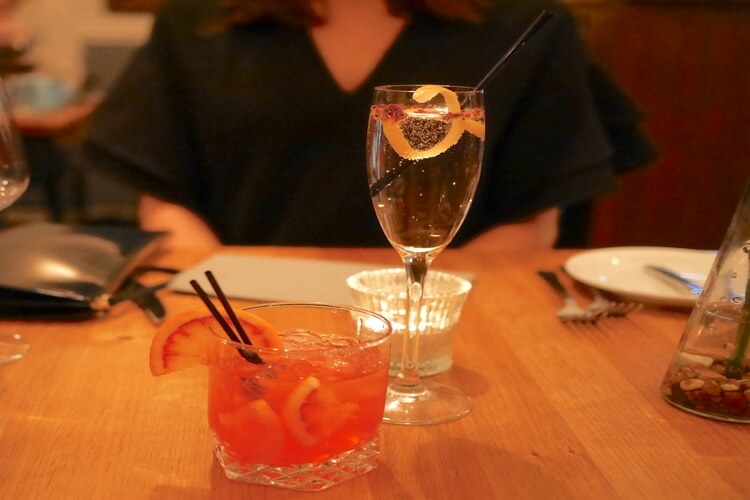 Margeaux ordered a Negroni made with Brighton Gin, and I went for the ‘Gin and Rose fizz’ (Blackdown Gin, Rose Lemonade, Prosecco, rose petals). “I made this for Valentines Day one year. It went down so well that we kept it on the menu,” Linda explained. I can see why. 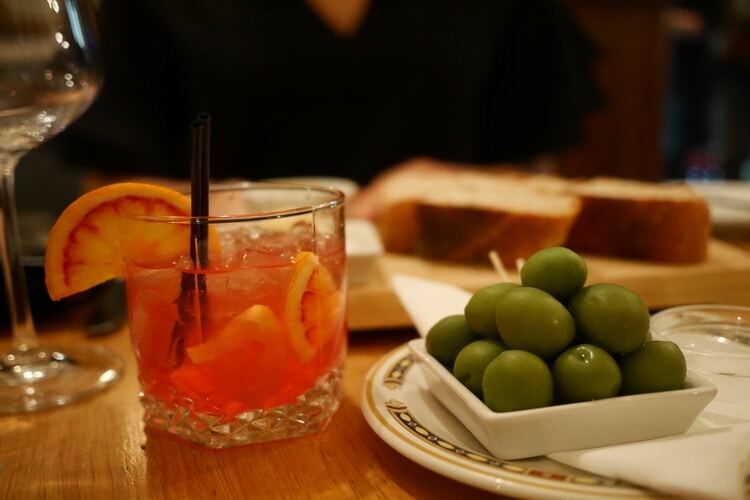 While we sipped our cocktails, we nibbled on fresh olives and wedges of homemade bread dipped into young olive oil and smeared with paprika butter. 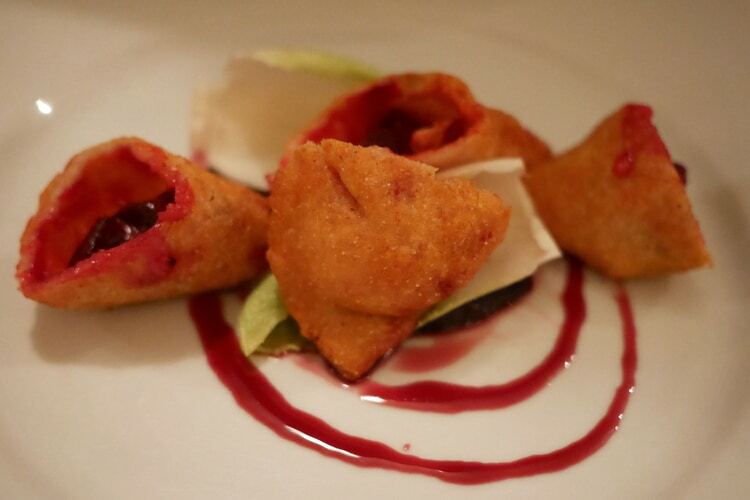 To start, Margeaux chose ‘goat’s cheese and beetroot empanadas with chicory and red wine.’ “We created this after trying something similar on holiday,” Linda explained. “It was popular on our lunch menu, so we decided to try it as a starter.” It was a good move. The beetroot really sung out, and was delicately laced with salty goats cheese. 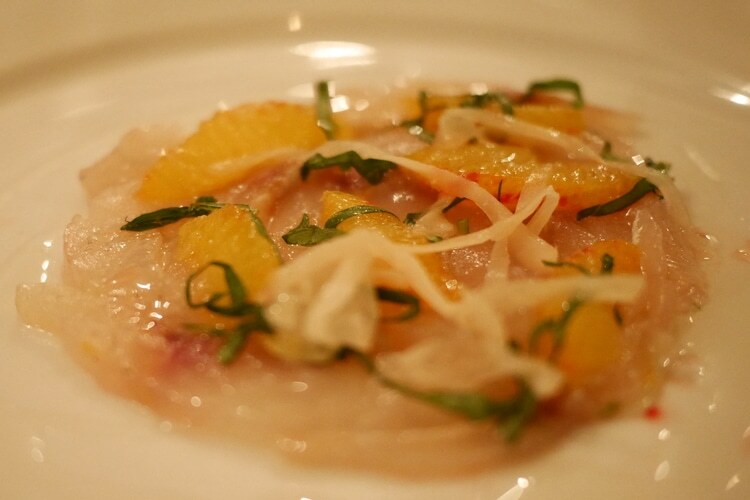 I went for ‘cured sea bream with citrus and ginger.’ Layered with flavours, my Brighton-landed bream was complimented with fresh blood orange, ginger and flecks of basil. Yum! For my main, it was a tough choice between the lamb rump, the ricotta ravioli, and the cod. Eventually, I chose the fish. A steaming bowl of sous vide cod, with clams and Parisienne gnocchi arrived, the garlicky aroma reassuring me that I’d made a good choice. My fish was melt-in-the-mouth, the clams tasted fresh from the sea, and a pool of salsa verde (parsley, garlic, lemon oil and fish stock) pulled everything together with a punch. 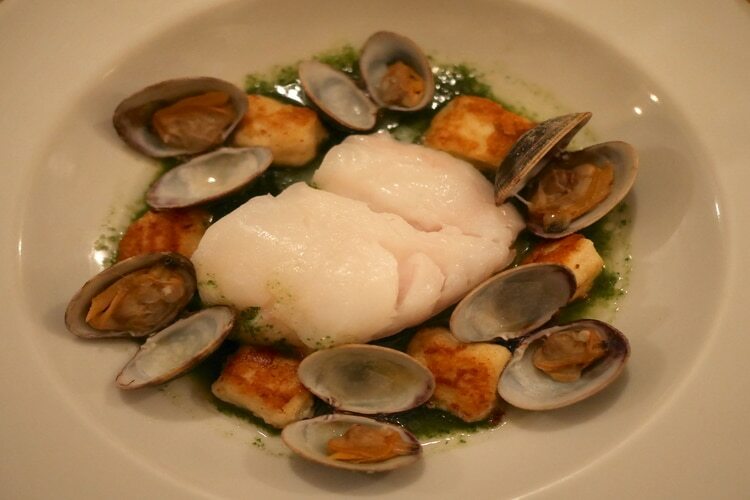 For wine, Linda recommended the Pasquiers Sauvignon – light and zesty, it’s a great pairing for fish. She also gave me a taster of the organic Adobe Gewurztraminer – a bolder, floral white, which was equally good. 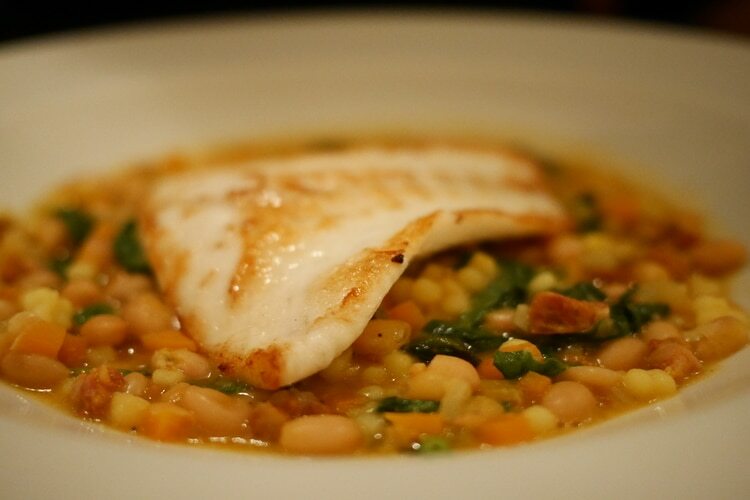 Margeaux’s seared turbot lay on a stew of white beans, chorizo and fregola (Sardinian pasta, similar to giant couscous). Doing away with convention, she ordered a glass of red with her fish – Palacio Del Camino Real Crianza, Rioja. “It works well with the smoky chorizo,” she grinned. Having not ordered sides with our mains, we’d missed out on the likes of leek gratin and hand-cut chips, but the pay-off meant we had room for dessert. 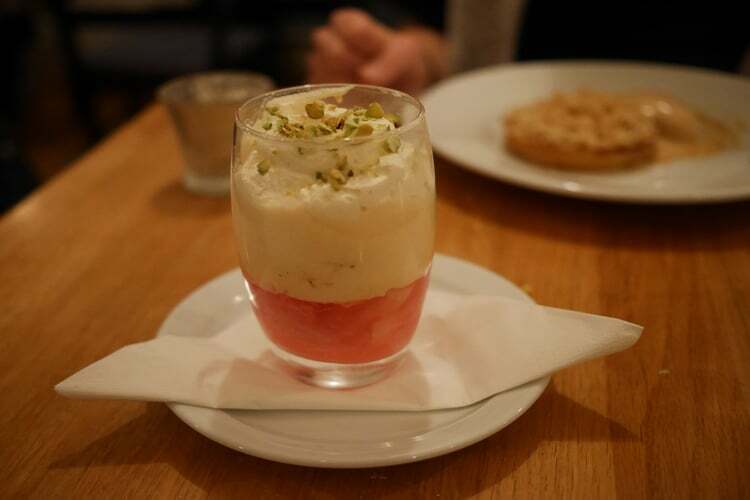 Scattered with pistachio chunks, my trifle had whole pieces of al-dente rhubarb, and a generous topping of whipped cream. Hiding at the bottom were crunchy Amaretti biscuits. 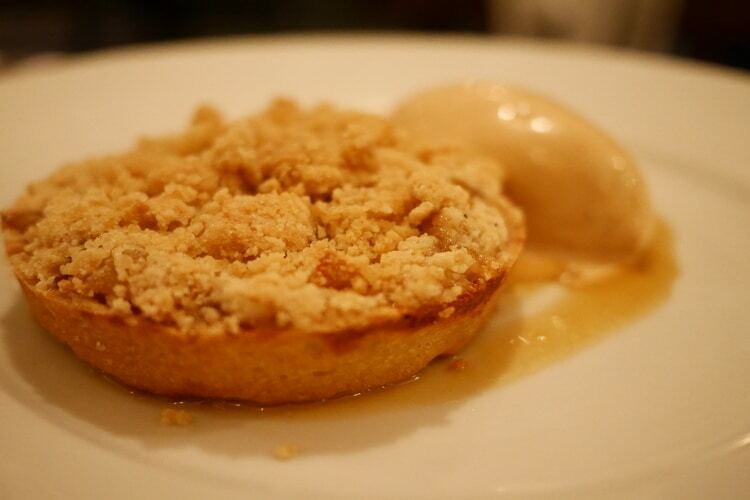 Margeaux’s apple crumble was served in a pastry case, with homemade salted caramel ice cream. When I stole a spoonful, the sweet-sharp apple and caramel combo reminded me of toffee apples. I’d loved my pre-dinner cocktail, so I decided to seal the meal with another. Linda suggested their ‘cocktail of the month’ – the ‘Peace Martini,’ which was created for two locals, in memory of their mother. Dry yet refreshing, it was an excellent balance to my sweet dessert. Even better, Semolina donates £1 of the proceeds to local charity Amaze, which supports disabled children. Across the table, Margeaux was savouring one of her favourite tipples: Pedro Ximenez. “It’s great, isn’t it,” Linda nodded, sharing her appreciation for this Spanish dessert wine. Semolina certainly lives up to its reputation for excellent food, but this London Road gem is more than that. 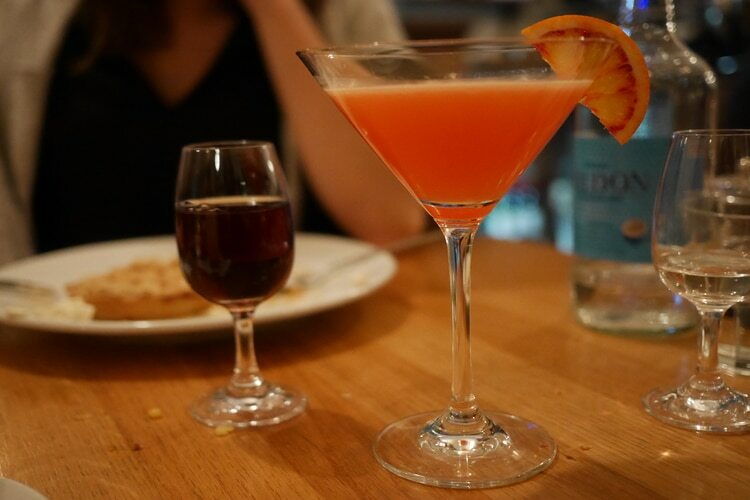 Every dish and drink is imbued with stories and passion, and the owners have a real connection with the food and drinks they create, and the people they serve them to. More than just a great restaurant, Semolina feels like part of the community – I’m just kicking myself that it took me so long to discover it.